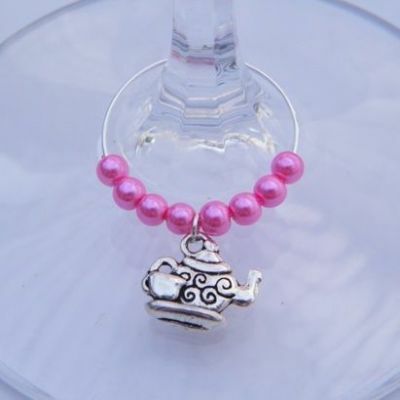 Tea Pot & Cup Wine Glass Charms - Beaded Style, available in different colours. Novelty Gift Idea. Lovely Beaded Style Wine Glass Charm, available in lots of different colours. We have a large range of Bead colours in stock, but we also help with special requests. So please contact us if you can't find what you are looking for. The Charm and Hoop are Silver Plated. The Wine Charm is reusable, just unhook at the back and pop on a different glass. They look great on any glass, especially Wine Glasses or Cocktail Glasses. Or even a Champagne Glass for an extra special treat! Wine Glass Charms are a great way to identify which glass belongs to who, lovely idea for Drink Markers at Special Occasions. Cheap in price, so they are perfect to buy in bulk and use as party favours. Themed Keepsake Thank You Gift for the Guests to take home after a Special Event. 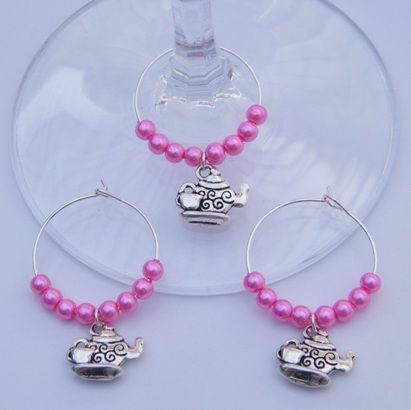 We offer a large selection of Wine Glass Charms - in a huge range of themes, styles and colours. All our Beaded Style Wine Glass Charms are Handmade to order by Retro Wishes in the UK. NOT to be used as a Toy or by Children under the Age of 3, due to small parts being a choking hazard.